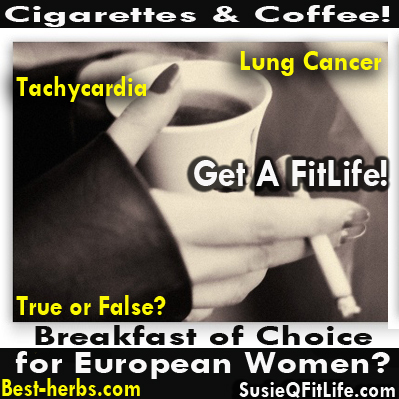 – September 12, 2012Posted in: Get A FitLife!, SusieQ FitLife Breaking News, SusieQ FitLife Updates! Let’s clear the smoke in the air regarding what a well-balanced breakfast should consist of; beginning with business ladies in Europe & the US. Instead of eating a healthy breakfast of cereal, cottage cheese or eggs; they end up with cup of coffee and two cigarettes on empty stomach. This is so not a wise choice in the long run and can be detrimental to one’s health. Generally, for healthy people, a cup of coffee is a good drink. It is good energizer and has many valuable antioxidants. Accordingly to the multiple researches when consumed in moderation (and is not very strong), it will NOT raise your blood pressure unless you are sensitive towards coffee. It is recommended not to drink coffee on empty stomach, as it is too acidic and can irritate the stomach lining that can cause digestive ailments. It is best to drink coffee AFTER breakfast and WITH a little milk or half-and-half, which neutralizes coffee’s acidity and its negative effect on your stomach. Another important tip: Don’t drink instant coffee. It is usually of much lesser quality and thus not very tasty. Coffee manufacturers use heavy chemicals to make coffee instant and not get glued into one piece due to moisture. Don’t drink coffee dripping through the white paper filters in the corner store. First – it is of low quality and bad taste, secondary – the paper filters are bleached with highly cancerous chlorine and the coffee becomes unhealthy. If you love yourself, and we know you do; purchase good coffee beans, grind them and make your own coffee in the coffee pot or espresso machine. When not at home, better drink espresso/cappuccino-type coffee. They use safe metallic filters and usually coffee tastes good. Smoking & Fitness = A FitLife? The negative health effects on smoking is going to require an article on its own; as many fitness enthusiasts believe it helps to keep them lean. 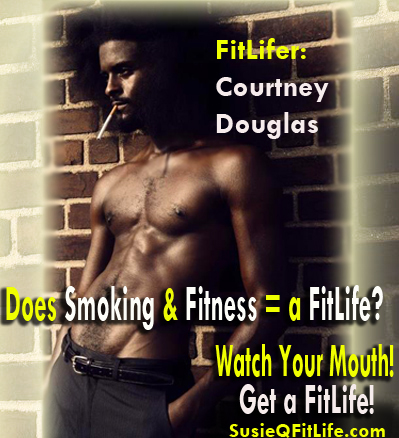 Our FitLifer, Courtney Douglas (seen photographed with a cigarette) was a frequent smoker. He proudly announces that he has quit smoking since 2009! The truth is that the carbon monoxide in the blood reduces the amount of oxygen that is released from the blood into the muscles. The inhalation of smoke impacts the respiratory system and can increase the airway resistance, changing lung volume. It is will greatly improve any one’s physical endurance and performance to be smoke-free! We hope we’ve made you hungry for a healthy breakfast! Here are a few suggestions to get your morning off to a good start! Eat a bowl of oatmeal or gluten free cereal, cottage cheese/plain yogurt with a handful of berries; or our personal favorite – 2-3 hard-boiled eggs. Yes, EGGS! They are healthy, satisfying, inexpensive and easy to prepare. One of the longest-living myths is that eggs are not healthy food. Before getting to scientific gibberish let’s apply some logic: whatever is good for a tiny, chicken embryo – should be good for people too. The egg white has better absorbable proteins than any meat. The yolk, which has been long considered by the pseudo-scientists or the employees of the Big Pharma industry as the main culprit for the high and unhealthy cholesterol levels, IS PERFECTLY HEALTHY UNDER ONE CONDITION – eat hard-boiled eggs instead of scrambled. Is a Yolk Just a YOLK? NO! 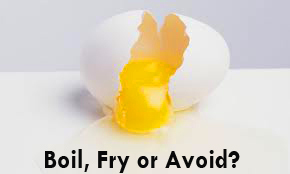 When the cholesterol in the yolk is oxidized with high temperatures, especially when it is in contact with the frying pan and very hot oils (as scrambled eggs); such oxidation contributes to chronic inflammation in your body, which is definitely associated with increased risk of plaque formation and heart disease. But, with hard-boiled eggs, the cholesterol is NOT oxidized and is not dangerous! It is in fact the opposite: accordingly to the latest INDEPENDENT researches. The egg yolk has all (even the rarest groups) of the natural vitamins your body needs and craves! Also, vitamin E and Lecithin which are generously present in the egg yolk have been long used by dietitians to LOWER CHOLESTEROL level. 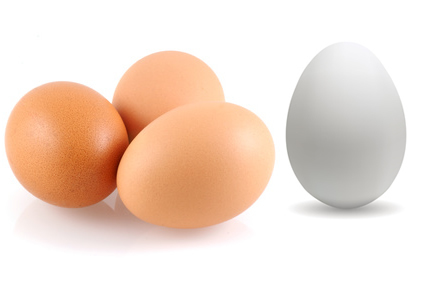 Thousands of bodybuilders, weight-lifters, wrestlers, track-and-fielders as well as other professional athletes, who need a lot of clean proteins for their bodies to grow; eat sometimes 5-10 hard-boiled eggs a day for many years and have normal cholesterol/ratio levels. Recently, news headlines were ablaze with startling information that eggs are nearly as bad for your arteries as cigarettes. After surveying more than 1,200 seniors, the researchers concluded that eating egg yolks on a regular basis is approximately two-thirds as bad as smoking with regards to the build-up of arterial plaque. That’s an incredible claim. The rest of the story is this: the “study” is based on interviews of stroke patients and their recollection of egg intake and admission of smoking history. The authors do acknowledge that the results are weak because they’re dependent on the patients’ self-reporting, memory, and honesty. They also say the finding that people with heart disease shouldn’t consume eggs is just a hypothesis and should be tested further. That hasn’t stopped the conventional media from running with it though, without any further scrutiny. There is a major misconception that people must avoid foods like eggs and saturated fat to protect the heart. While it’s true that fats from animal sources contain cholesterol, this is not necessarily something that will harm an individual. Cholesterol is in every cell in your body, where it helps to produce cell membranes, hormones, vitamin D and bile acids that help you to digest fat. Cholesterol also helps in the formation of memories and is vital for your neurological function. Data studies have shown that egg consumption actually promotes health; as egg consumption above a certain level, shifts the size of the LDL particles from small to large, making them harmless. Maybe eggs contain nutrients that promote overall health, leading LDL particles to “behave” and do what they are supposed to do. Maybe it is a combination of these and other effects. Other research has found no link between eggs and heart disease. Additionally, while the subjects were reportedly asked about medications, drug use was not evaluated to see if there were any correlations between drugs and an increased risk of arterial plaque build-up. After all, these subjects were all stroke patients, and are therefore likely to be on cholesterol drugs. Statins, as we now know, are associated with an increased risk of diabetes, and heart disease is the number one killer of diabetics. Accordingly to many Chinese researches anti-cholesterol drugs damage kidneys, pancreas and liver, causing irreversible and dangerous side effects. So is the increased plaque build-up really caused by egg consumption, or is it related to drug-induced diabetes? Overall, the idea that eggs are unhealthy is a complete myth, one that’s easily debunked if you look at the evidence. • Consumption of more than 6 eggs per week does not increase the risk of stroke and ischemic stroke. • Proteins in cooked eggs are converted by gastrointestinal enzymes, producing peptides that act as ACE inhibitors (common prescription medications for lowering blood pressure, thus they are good for your healthy blood pressure). Heart Disease is one of the easiest diseases to prevent & avoid; just like type 2 diabetes BUT, you simply must be proactive! Risk Factor NOT: Cholesterol/HDL Ratio?! 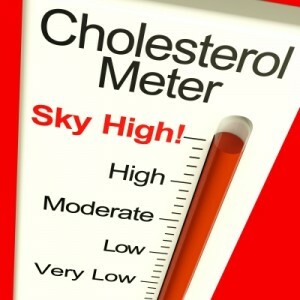 • HDL/Cholesterol ratio: This percentage is a very potent heart disease risk factor. Just divide your HDL level by your cholesterol. Ideally, it should be above 24 percent. Below 10 percent, it’s a significant indicator of risk for heart disease. • Triglyceride/HDL ratios. You can also do the same thing with your triglycerides and HDL ratio. This ratio should be below 2. Never forget to Watch Your Mouth & Get a FitLife! Can I just say what a relief to discover an individual who really understands what they are talking about online. make it important. More people have to read this and understand this side of the story. After smoking for a long time I quit. It’s bee 20 plus years now. I know what’s it like to quit and more importantly I know how great it feels to be free of them! Keep up the great work and inform the folks of the importance of a healthy lifestyle! 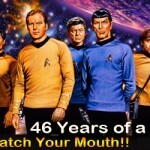 Star Trek FitLife Workout Revealed? !